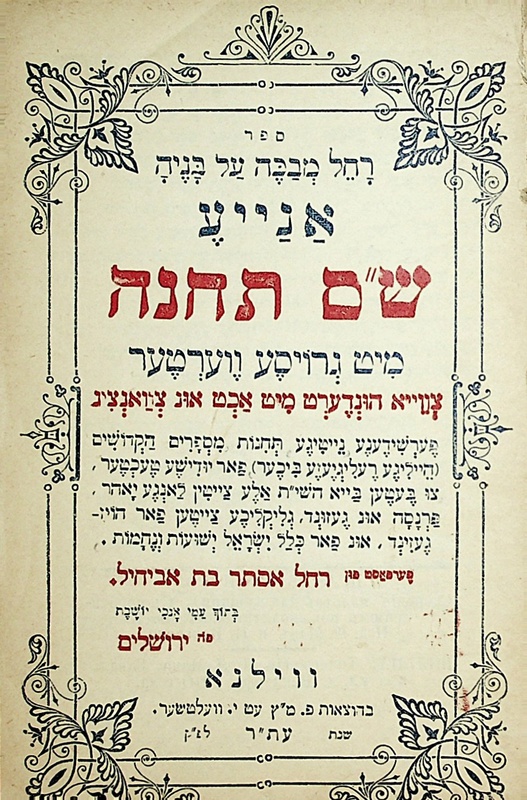 Rokhl M’vako al Boneho is a compilation of Jewish women’s prayers in Yiddish published in Vilna in 1910, with prayers attributed to Rokhl Esther bat Aviḥayil, a Jewish woman living in Jerusalem. The phrase “Rokhl M’vako al Boneho” is from Jeremiah 31:15. This digital scan of Rokhl M’vako al Boneho was prepared by Aharon Varady from a copy held in the collection of the Klau Library (HUC) in Cincinnati, Ohio. The scan was made in order to create faithful transcriptons and translations with direct reference to the original work. A selection of 13 prayers appearing here were transcribed and translated by Rabbi Tracy Guren Klirs for her dissertation, later published as בזכות אמהות The Merit of Our Mothers: A Bilingual Anthology of Jewish Women’s Prayers, Cincinnati: Hebrew Union College Press, 1992. “רָחֵל מְבַכָּה עַל־בָּנֶיהָ | Rokhl M’vako al Boneho: A Nayye Shas Tekhine :: Raḥel Weeps for Her Children: A New Collection of Teḥinot (Vilna 1910)” is shared by Rokhl Esther bat Aviḥayil with a Creative Commons Attribution-ShareAlike 4.0 International copyleft license. Please reciprocate for any adaptation or redistribution of this work by (1) properly attributing the work to Rokhl Esther bat Aviḥayil and Unknown Author(s), (2) clearly indicating the date you accessed the resource and whether any changes have been made (and if so, please be in touch with us and leave a comment below so that we might note your adaptation or improvement), (3) providing a link back to this source, and (4) specifying the Public Domain (17 U.S. Code §105 - Subject matter of copyright: United States Government works) under which this work was shared.